It's been a slow period of adoption for natural gas vehicles so far in 2014. Will activity begin ramping up anytime soon? If you look at the activity at Westport Innovations and Clean Energy Fuels, you might be surprised to see natural gas vehicle adoption is already happening in commercial transportation. The bi-fuel Chevy Impala can use either CNG or gasoline. Over the past few years, North America's massive supplies of natural gas were supposed to lead to a renaissance in natural gas vehicles. So far, it just hasn't happened -- at least not in any way that's all that visible to the American public. The benefits of natural gas as a transportation fuel include reduced tailpipe emissions, much lower cost than gasoline or diesel, and its benefits in reducing imported crude oil and helping drive the American economy. As of today, there are only two factory-built natural gas-powered cars available in the U.S.: General Motors' Chevrolet Impala and Honda Motors' Civic CNG. So while NGVs for the consumer -- and the 30% fuel cost savings -- remain essentially dead in the U.S., there is a shift underway in commercial transportation. While growth looked relatively muted during the first half of the year, there's some evidence that it will accelerate in the second half, and the adoption trend could see years of growth going forward. So far, several of the companies pushing this change have underperformed, but that looks to be changing in coming years. Let's take a closer look. The wholesale price of natural gas has declined sharply, while diesel prices have continued to rise. 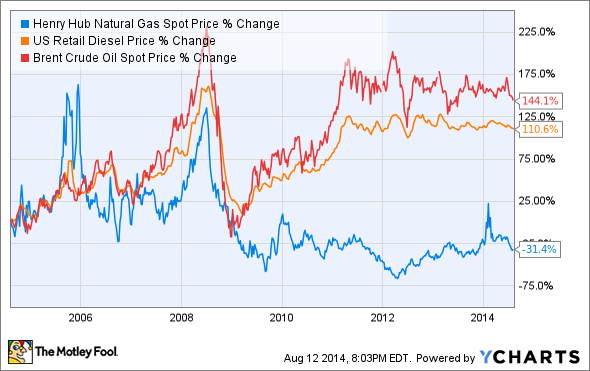 As of August 12, natural gas was $3.97 per MCF, which puts it at $0.50 per gallon equivalent. Add in the costs to transport, compress, and liquefy, and it remains cheaper than diesel by upwards of 30%. Heavy trucks can consume 20,000 gallons per year, compared to less than 1,000 for the average car. Source: Clean Energy Fuels. Americans consumed over 134 billion gallons of gasoline and 30 billion gallons of diesel for on-road transportation last year. The gasoline market is bigger, but widescale adoption of a new type of fuel is challenging to roll out with so many consumers. The diesel market is smaller, but the vehicles consume 10 to 20 times more fuel. For many fleet operators, fuel is one of the largest line items in the budget, and cutting that cost by 20% or more represents an attractive opportunity. This is the idea driving both Clean Energy Fuels (NASDAQ:CLNE) and Westport Innovations (NASDAQ:WPRT). By targeting fleet operators, both companies have a more focused market to penetrate. Additionally, building a targeted refueling infrastructure to support fleets is more feasible than a national network to support passenger cars. Cummins Westport President Gord Exel with ISX12 G engine. ...the shipments are pretty much as we expect. The reaction to the ISX12G has been positive, and there have been no surprises there as far as we are concerned. We are seeing that customers typically are placing seed orders for five or 10 units to such point they are comfortable with the integration of the vehicle, with infrastructure, and with support. But for the most part, all reactions we are getting on the ISX12 G have been extremely positive. One of the reasons you see an uptick in both inventories and receivables is we are wrapping up iCE PACK sales, and we had some collections on that, as well as some prepayments on inventories that we are building up to meet our delivery targets for Q3 and Q4. The iCE PACK is an LNG fuel system for heavy trucks, so increased inventory is a positive indicator. Since every iCE PACK unit will be sold with an ISX12 G engine, this is doubly good. One of the challenges for NGV expansion has been access to fuel. Clean Energy Fuels is the dominant provider of CNG and LNG for fleet operators and truckers alike. As the largest supplier of LNG for trucking, increased inventory of iCE PACK systems at Westport is a positive for Clean Energy Fuels. So far in 2014, Clean Energy -- which already operates 500 stations across the country -- opened 27 locations, and it announced plans last week to open another 45 this year. Data source: CLNE SEC filings. As the table shows, fuel delivery growth is accelerating across the board. While much of the company's stock underperformance over the past couple of years is tied to its heavy spending to build out a network of stations for heavy trucking, it's now sitting on around 60 unopened, completed stations located at Pilot/Flying J truck stops. This has dragged on the bottom line, with debt expense pushing $40 million per year, but the expense means the company is prepared to open stations with only a few weeks' notice to support trucking customers. Pilot/Flying J is America's largest truck stop operator, so those stations are in favorable locations. It's been a disappointing two years for investors in either of these companies; my portfolio has the scars to prove it. Both companies continue to lose money, though they have provided metrics to show the trends point toward profitability. Investing is often about being able to identify long-term trends early, and it's looking like an acceleration in adoption will shift both companies to profits before either faces a cash crunch. There's risk here, but the payoff could be enormous if those trends continue.